Show us a pic of your camp set up, and how it fits onto your bike ! Re: Show us a pic of your camp set up, and how it fits onto your bike ! Those are some interesting pics you have there. How about some info? Really good to see someone make the most of their bike. Reminds me of the 70's - my XT500, camping and fishing gear and refreshments and I still had place for the girlfriend sometimes!! Unfortunately dont have any photos. Nothing beats camping on a bike. Black crate containing gas stove, army dixies, can opener, cutlery, Mrs Balls Chutney, coffee, sugar, milk, cup, kettle, tyre weld, bag of cable ties, rope, 12v LED strip lighting, 12v cell charger, 12v gps charger, washing up liquid, sponge, drying up towel, salt, pepper, braai spices, a dozen eggs in egg carrier. On top of that I then have my self inflating mattress (memory foam) and sleeping bag with self inflating pillow as well as a thin blue sponge mattress which I use first before my mattress goes on top (in case there are sharp objects under the tent). On top of that I then strap my 4m x 5m groundsheet with poles. This provides an excellent lightweight huge shady area at campspots ! Also on the back is my braaigrid in canvas holder which has my braai tongs and blitz. On the tank is my tank bag which holds all my 12v accessories, toiletries, underwear, phones, wallet, gps (I only whip the gps out when Im stationery to get an idea where I am going. Dont like navigating with it mounted, takes the sense of adventure away). On top of the tank bag i strap a cooler box with 8 ice cold beers layered in ice (must have beer when stopping at your destination) !! 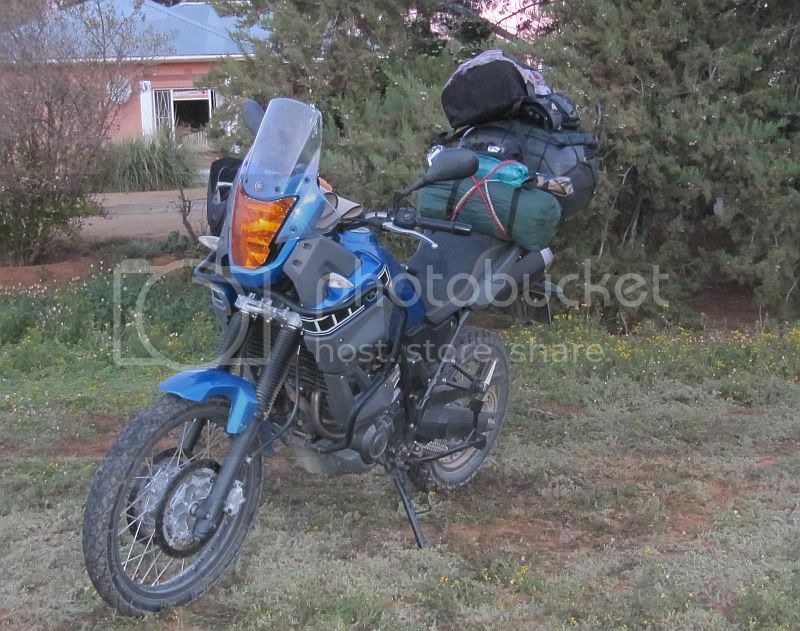 Sometimes I will strap the tent to the front of the bike, depending on my loadweight as I have taken a potjiepot with before. Just imagine if you get a GS you will be able to load a kitchen sink and a fridge for those beers! I love that honda of yours! hahahaaaaa, my boss joined us for a camping trip 2 weeks ago, also on a 250cc and he DID bring a kitchen sink !!!! :thumleft:You get them these days in aliminium ! I remember this one, it was awesome. We happy campers load EVERYTHING !!!!!! !